A Trench Spade, this Norman Rockwell painting, appeared on the cover of Judge published May 25, 1918. An alternate title for this painting is Soldiers Playing Cards. This was the fourth cover by Rockwell to appear on Judge and the second of four in 1918. Only six Rockwell covers were published by Judge, from 1917 to 1918. Rockwell only submitted to this smaller magazine after the publishers of the more popular magazines had declined to publish the cover illustration. Rockwell's clear preference and his first choice of publication was The Saturday Evening Post. He believed, and his career confirmed, that the Post cover was America's biggest showcase window for artists. This is a fairly unique cover for Rockwell. The whole cover is presented as a giant playing card, the Ace of Spades. These two soldiers are playing cards in a trench, relaxing during an off-moment of World War One. Notice that even during an off-moment, they still wear their uniforms, including helmets. They are still on the front. The American soldier wears a brown uniform. The soldier in the blue uniform is a Belgian infantryman. I believe he is Belgian for a couple of reasons. First, I found a database with most of the uniforms of World War I. Belgian infantry was the only uniform that was not brown, green or grey. They were the only uniform that was blue. Second, many of Rockwell's other paintings from this era depict American soldiers in Belgium. Two of his Life covers actually mention Belgium in the title. 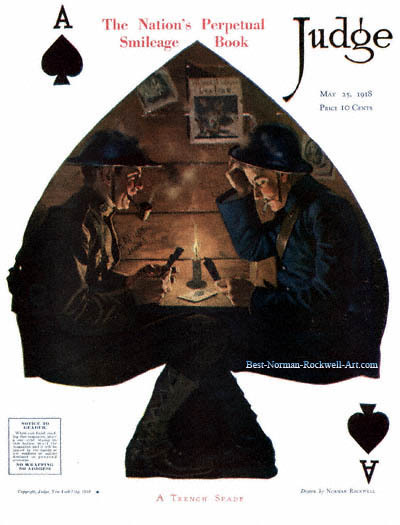 So, we have an American soldier and a Belgian soldier playing cards by candlelight in a barracks built in a trench. They are in such close quarters that their knees are touching while they play. The Ace of Spades has been played and rests on the table, waiting to capture an inferior card. The American apparently played the Ace. He has a delighted look on his face. The Belgian is perplexed, trying to figure which card to play. Tacked on the wall in the background are pictures from home and a Leslie's magazine. These help the soldiers remember why they are fighting .